The KNEE Boot- Wear with dresses, shorts, skirts, denim or leggings to accentuate your legs. The RIDING Boot- Idea for cool fall weather. They look good with denim and leggings . The ANKLE Boot- Versatile (looks stylish with almost anything) and is universally flattering, it lends height and provides coverage. The STILETTO- All around outfit enhancer for special occasions or dressing up denim. The CHUNKY Heel- If you are not into the balancing act of wearing stiletto heels then a chunky heel would be a better choice for you. The chunky heel is leveling so it gives you more stability while walking. They also look chic good with anything. Flats- This versatile shoe can be worn for casual days and if you purchase a pair that is dressy you can also wear them to work. The LOW heel- You can wear low heels during your eight-hour workdays to alleviate foot pain or discomfort. Click on the image to see where you can purchase these pieces from. Click on the image to find out where you can purchase these products from. Miss Oops Rescue Sponges removes embarrassing stains such as makeup or deodorant residue on clothing. The best thing about this product is the fact that it fits in your purse so you can carry it everywhere with you. Foot Petals add cushioning and support while wearing high heels. You can also buy animal print Foot Petals to add some excitement to the soles of your feet. Bling Guard aid in preventing loose rings from slipping off your finger. These guards also help balance the weight of heavy earrings. The shoes will debut in November. I’ve already made all three and they will be featured in my videos and in the album packaging. 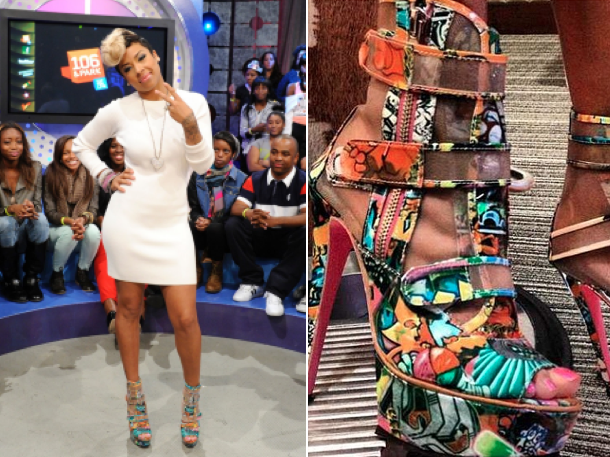 Kudos to Keyshia Cole for taking a stand for attainable fashions! Nicki Minaj had her Pink Friday Tour Atlanta stop this past weekend. On the way out of the Fox Theater she greeted fans wearing a rainbow bright outfit. I actually like this look because the color scheme is cohesive. This was rainbow bright done right and the toned down hair is a plus. For those that inquiry, she carried a baby blue shiny patent leather Louis Vuitton Speedy Round city bag. Of course her high top sneakers are designed by Guiseppe Zanotti. Accessories Oh My!, Mean Walk, Who's Got Style? Gwyneth Paltrow was spotted wearing this gorgeous Emilio Pucci Embellished midriff-revealing ensemble when she attended the 2011 Emmy Awards. Kim Kardashian recently wore the same ensemble when she attended Diddy‘s yacht party in Cannes. I feel that Gwyneth wore this Emilio Pucci ensemble better because of her toned stature. She wore the ensemble it did not wear her. I did not like Kim’s earring choice and the ensemble did not flatter her figure at all. No shade, she is still one of my top fashionista’s! Both ladies wore the Emilio Pucci Embellished Cropped Black Top & Siren Skirt , but the question is…Who’s Got Style? Vote below. You can purchase these at SevenNy or Solestruck. VH1’s Love & Hip Hop star Emily B is the latest cover girl for Pynk Magazine. In Emily’s interview she talks about building her brand, her shoe collection and the perfect shoe every girl should have in her closet. Read exerts below. Tell us about some of your entrepreneurial pursuits. I’m actually starting my own clothing line, called Emily B. It’s going to be feminine, chic, trendy, and of course, affordable. I want to start a line that all women and young girls of all ages can wear and afford. Do you find that your passion for shoes influences you as a stylist? It’s just a part of being a stylist. I love to shop, I love fashion, and I love girly things. Shoes are definitely an inspiration for me. I start off with the shoes and work my way up and around it. What’s the most you’ve spent on one pair of shoes? $5000. And they were special edition – crystallized, but I would never do it again. It would have to be a very special occasion. Other than that, I don’t want to spend over $3000. Never again. What’s the perfect “PYNK” girl shoe? Every girl should own a good black pump, even if it’s just an open-toed pump. It’s versatile — she can wear it with anything, she can wear it with jeans, she can dress it up and wear it out with a cocktail dress. This Winter issue of Pynk Magazine will be available on New Years Day. My personal favs are ‘Hot To Trot,’ ‘Funky Money Jane,’ ‘T.L.C in Caramel,’ and the ‘Ri Ri Boot’ which Cheryl is wearing in her promo ad. Will you be purchasing any of Cheryl Cole’s fab shoes?